Over one-half (51%) of Super Bowl viewers enjoy the commercials that air throughout the game more than the game itself, according to the Nielsen Company. The remaining 49% say they enjoy the game more than the ads. Across three metrics of ad effectiveness, including general recall, brand linkage, and likeability, there is a steep drop-off as the game progresses to the fourth quarter, when ad performance settles at a level that is closer to the average for all television ads. 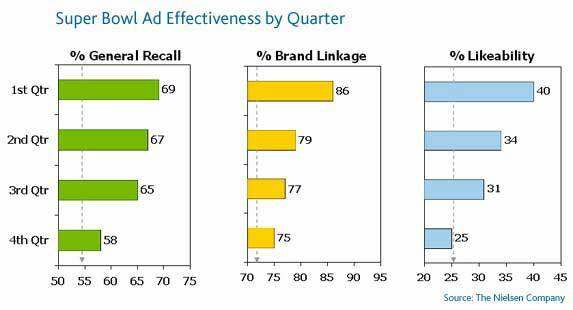 For example, general recall for ads airing in the first quarter of the game is on average 69%, but slips to 58% by the fourth quarter. Likeability for ads in the first quarter is on average 40%, but falls to 25% by the fourth quarter.